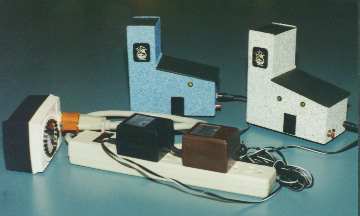 The above picture is depicting two early DISCONTINUED custom-built Model 1's sharing a power strip that is plugged into a remote timer. Both feeders can be "triggered" and powered by only one remote timer through their own low voltage power adapters. All Super-Feeder® are operated using the same principle with a 120v power source, although they can also be special ordered with a digital DC timer (available from us) to use with a 12 V battery. Remember...each Super-Feeder® has its own internal adjustable feeding timer and mechanical volume control that you can adjust to control the amount of food dispensed, TOTALLY INDEPENDENT OF THE LENGTH OF TIME THE REMOTE TIMER REMAINS "ON". An economical 24-hour timer such as this one is ideal to operate your Super-Feeder® (if you do not already have one). As an example, with 96 on-off 15 Min. pins, this timer can provide up to 48 feed cycles per day (24 hours). The ASF-1, KSF-2 and CSF-3 can also be triggered twice in as little as little as 3 minutes apart using a digital timer. You may control your Super Feeder from anywhere using your Smart Phone with our Wi-Fi Socket. 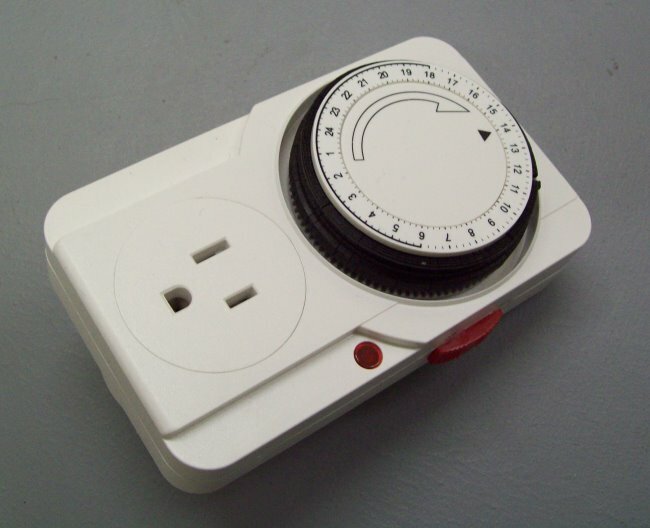 For the individual who demands very exact time, we recommend and stock programmable 120 Volt [digital] timers with an internal battery back-up to keep programs and correct time at all time even when disconnected. TO ORDER click on [Order/Price List], or for a complete list of timers to better help you choose which one is best for you, click on links below for a full picture and info. YOU DO NOT NEED AN EXPENSIVE TIMER!! GO TO: "SEE TIMERS YOU CAN USE AND HOW FEEDERS WORK" "AQUARIUM MODELS" "OUTDOOR MODELS"